This guest post is by Anthony Chow who blogs at http://cloudn1n3.blogspot.co.nz/, where you can find his back catalogue of posts. Find out more about the guest blogger program here. Back in 2008 when I first started to learn about VMware’s server virtualization technology, it is very confusing on the different products and how they are related together. There are the ESX, ESXi, vSphere and vCenter server and there are older products such as VMware server or the GSX server. With Google we can find lots of articles on these products but the problem is that most of these articles do not have a date and since the VMware virtualization technology is advancing in such a high pace, we do not know if the information was current or relevant to which version of vSphere. Now in 2015, can you tell me all the current VMware products and how they are related? To look at VMware’s product offering, it is best to look at VMware’s vision on data center – Software Defined Data Center architecture. VMware’s idea is to provide an abstraction layer for compute, storage and network hardware so that the entire data center is software driven. Make Disaster Recovery easier thus able to improve RTO and RPO. The benefits of a Software Defined Data Center architecture is not limited to the above mentioned points and it is not the main point for this article. Each of these different products under the above mentioned categories can be deployed separately and as a whole they formed the vCloud Suite. At the heart of the vCloud Suite is the vSphere Suite that provide the virtualization infrastructure for different business establishments from SMB to enterprise to cloud operators. I don’t think I need to describe much about the vSphere Suite as this has been around for a number of years and are widely deployed. 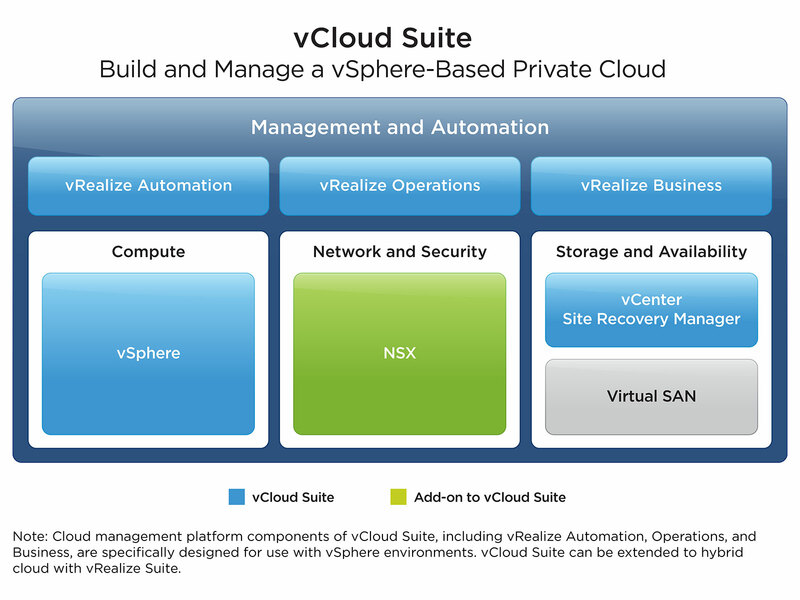 The VMware vRealize™ Suite provides the management and automation capability for the Software Defined Data Center architecture. Basically, the vRealize Suite comprise of Automation, Operations and Business and Log Insight for monitoring. For a more comprehensive and detailed description of the vRealize Suite, this VMware site is a good place to visit. For all IT operations, disaster recovery is an important element. Each business should defined the Recovery Time objective (RTO) and Recovery Point Objective (RPO) for acceptable level of disruption in case of a disaster event affecting the continuous operation of the IT infrastructure. Most importantly DR plans needs to be tested. VMware vCenter Site Recovery Manager provide customer the ability to automate and orchestrate non-disruptive testing of recovery plans. With automation and orchestration, the RTO and RPO can be improved. For more comprehensive and detailed description of VMware vCenter Site Recovery Manager visit here. I am not sure why VMware group storage and availability into the same category because availability also include the compute and networking pieces that support the application that we are ultimately concern with. There are many other blog post talking about these products. This blog post is meant to provide an overview and how these products related to each other. This is an add-on to to the vCloud Suite. In this category is the NSX – VMware’s way of providing an abstraction layer to the physical network as well as some L4 – L7 network services. NSX is also a security product as I have talked about in my previous post. NSX virtualized the network as well as network functions such as load balancing, firewall and VPN. Any Cloud management platform including OpenStack can interact with NSX via RESTful API to provision network services for the cloud platform. NSX has two flavors as I have outlined in this post. One flavor is tailor toward vSphere product and the other one is for non VMware hypervisors such as KVM. One point worth mentioning is that NSX can optimize the VXLAN multicast traffic because the NSX Controller is able to distribute the MAC address and VXLAN ID mapping to the various VTEPs instead of using bi-directional PIM as defined in RFC 7348 (I have a summary of this RFC here). Multicast traffics takes up network bandwidths and network administrators always try to find ways to eliminate multicast traffic. For a complete list of VMware products we can find them here. In this post I have not talked about the End-user computing product of VMware – Horizon nor the VMware hybrid cloud product – VMware Air which is the VMware’s offering of public cloud similar to Amazon’s AWS, Google’s Cloud platform or Microsoft’s Azure. 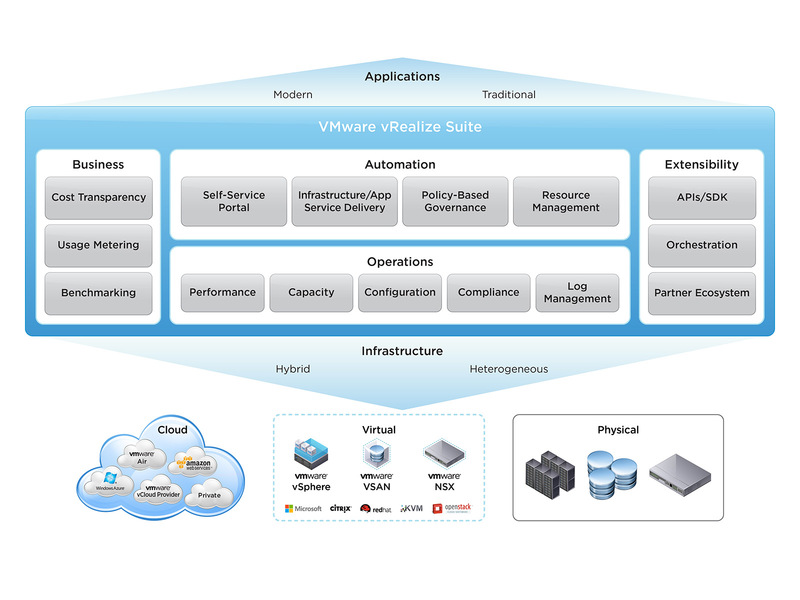 I hope this will clarify VMware’s product offerings and how they relate to each other. This entry was posted in Guest posts, VMware. Bookmark the permalink.